Bilbo Baggins, the star of the book The Hobbit doesn’t have any debt. This little hero knows how to manage his resources. If we want avoid debt, and live a full life, we can take a few lessons from Mr Baggins. 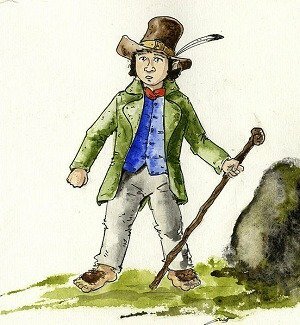 Bilbo Baggins was a hobbit who lived within his means. He wasn’t ostentatious with his possessions. Additionally, he lived a rather retiring life. Even when he left to go on adventures, he packed lightly and didn’t over-burden himself. The fact that he was able to drop everything and go on an adventure speaks to his frugal nature. How many of us have banked enough money that we could simply walk away from our daily life and travel the world on a day’s notice? Of course it was possible partly because he was a bachelor with no family to support. However, it kind of reminds you of the Millionaire Next Door book and the people driving rusty old pickup trucks and wearing threadbare jeans that have millions in the bank. This goes along with living within your means. Rather than spending on stuff that isn’t important to you, focus on the things that matter in your life. Bilbo didn’t cheap out on the things that were important to him. Good food and good long-bottom leaf for his pipe. No skimping there. He spent money on the things he enjoyed, and didn’t bother much with the stuff he didn’t care for. And, when he reached his 111th birthday, he threw a party for his friends. It was important to him, and he could afford it, thanks to a long life of living within his means. Hard work can get you far. When Bilbo finally did leave his hobbit-hole, he didn’t shirk from hard work. But he also had to work smart. If you want more money, whether it’s to meet your expenses without going into debt, or whether it’s to pay off existing debt, you need to work smarter as well as harder. Bilbo’s intelligence and quick thinking got him out of a number of binds – and it provided him with a marvelous treasure in the form of a magic ring. Additionally, his smart moves in helping to observe Smaug and deal with the dragon resulted in his receiving a handsome monetary reward. Work with your tools to help you save money. The ring turns out to be a rather useful tool (whatever its drawbacks later on). Additionally, Bilbo ends up with a sword that proves helpful in escaping the spider later on. When you are working on your finances, it helps to use the tools at your disposal. Use personal finance software to track your spending so that you know where you stand. Use investing tools to help you build a retirement portfolio for the future. If you want to stay out of debt, and work toward financial freedom, you need to make smart use of the tools you have. Bilbo and the dwarves put together a plan to help them reach their goal of regaining their lost riches. They outlined what needed to happen in order for them to reach their goal. They needed to read an arcane map, travel to the Lonely Mountain, get in, and then outsmart the dragon. If you want to stay out of debt, you need a plan for how you’ll spend and save your money. If you run the numbers you’ll know where the potential pitfalls are hiding that could get you into debt. You can, and probably will, need to change your plan as life moves along. If you see any of those danger areas popping up you’ll know to take extra care to keep out of debt. Just like Bilbo’s adventure was a journey, your personal journey to keep your finances in order and to avoid debt will have ups and downs. To hear from 21 people that had low points and got into large amounts of debt, check out their profiles in my new Debt Heroes book. The good news is they all paid off their debts and went on to share their stories as personal finance authors or bloggers! They collectively paid off over $1.7 million in debt using a variety of methods and their stories are all profiled in the book. Ben Edwards writes about personal finance at Money Smart Life and is one of the authors of the Debt Heroes book.